We’ve always been about the fusion of better ingredients and better taste. It’s about time we started looking like it. As of June 1st, 2018, PlantFusion has a new look. This new packaging is inspired by our love of ingredients and our desire to create plant-based, nutrient-dense, allergen-free products that delight the senses. Every transparent detail counts as we personally craft each product by selecting the seeds, plants, and final ingredients. This fusion of unique ingredients and flavors provides complete nourishment. 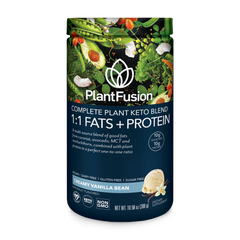 Phil Vigeant, the CEO and co-founder of PlantFusion and owner of Reliance Private Label Supplements is “...excited to be introducing a refreshed concept for PlantFusion that visually displays the vibrant green plant protein sourced ingredients and related nutrients used in our products,” said Phil.. “We are obsessed with delivering authentic, 100% plant-based products and have spent over two years traveling the world source new ingredients to develop the delicious flavors and texture that our consumers have grown to love.” Read more about our story here. And there will be many more great changes to come! Expect to start seeing the new package on store shelves next month – July 2018. You are not being truthful. There is zero chocolate flavor in the version due to lack of sweetener. Only learned of this after speaking with your customer service people to complain about the flavor in the new formula. STOP SAYING ONLY THE PACKAGING CHANGED! Sorry to say you have lost me a customer and our family buys over 100lbs a year of your product ! As one who suffers from Celiac disease and most of the other major allergens, I found Plant Fusion at a gluten – free fair in Salt Lake City, Utah when it first came out. I tried a sample, loved the taste and have been hooked since. For the past 7- 8 years, I have had a Complete Protein chocolate shake with a banana every morning for breakfast. My husband enjoys the vanilla flavored because he can add berries or whatever else he wants (he doesn’t suffer from any allergies but loves the flavor! We also have Plant Fusion in our food storage because it’s something I can eat in an emergency. I, also, take it on trips so I can have a shake in our motel room while my husband eats at the breakfast bar. Needless to say, Plant Fusion has been (and continues to be) a lifesaver for me!! 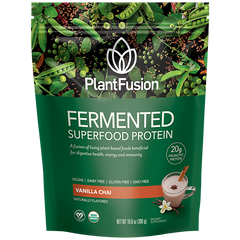 I’m excited about the new line and looking forward to trying the Fermented Superfood. I do not use facebook but do use e-mail so would like to be entered in your drawings. Thank you for all you do for those who suffer because many foods are not their friends – Plant Fusion definitely is!! !